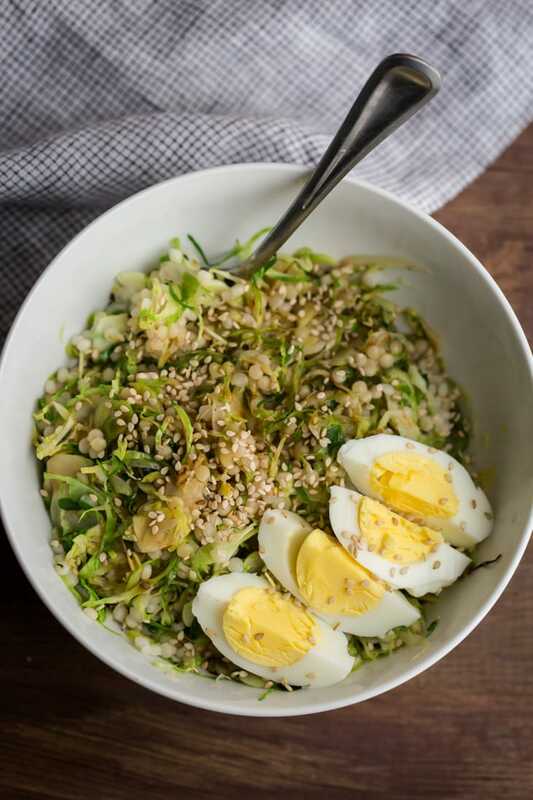 Hard Boiled Egg and Brussels Sprout Bowl | Naturally. If you follow me on instagram, this recipe may look vaguely familiar. I posted a paired down version that I had thrown together for lunch from two other recipes I had worked on the same week. Since then, I’ve eaten a version of this bowl nearly every day. This version has been slightly gussied up thanks to the addition of hard boiled eggs (a staple in my kitchen right now) and a bit of ginger/honey thrown in with the soy sauce. These are my favorite types of meals and a good reminder that ‘leftovers’ do not always have to mean a full meal. I love having leftover grains and leftover vegetables to combine into something brand new (helps keep the ‘leftovers’ feeling exciting!) I recommend making a big batch of grains and hard boiled eggs ahead of time, then you always have a meal! In a large pan, heat olive oil over medium-low heat. Add the brussels sprouts and shallots then cook, stirring occasionally, until tender, 8 to 10 minutes. Add in the previous cooked (or just cooked) grain and continue to cook for another minute or two. Whisk together the soy sauce, honey, and ginger in a small bowl then add to the Brussels sprout mixture. Divide the brussels sprout mixture into two bowls. 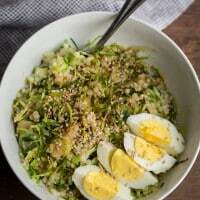 Slice the eggs and finish with a sprinkle of sesame seeds. I prefer couscous or quinoa if I’m cooking the grain along side the brussels sprouts. However, leftover longer cooking grains (from previous meals) are great too! I’ll also often just use the soy sauce and leave out the ginger/honey. Long live brussels sprouts! This recipe is great. Thank you! Oh wow this looks so yummy. I will have to try this next week. Thanks for the lovely recipe! I can’t get over how much I want to dig in to this bowl. I may become obsessed with this dish! Pinned! Looks Yummy! Do you add the sauce while it’s cooking or after it’s served in bowls? Ah, I didn’t finish my thought. I added it after I cooked, before I placed it in the bowls! It looks yummy. I can’t wait to try this recipe!! 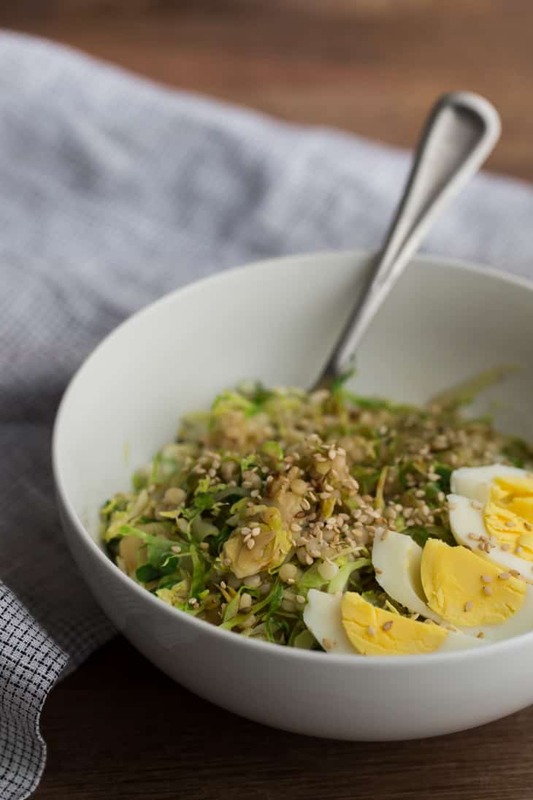 I love the Asian dressing paired with the Brussel sprouts and egg…perfect combination. This is exactly the kind of simple combination I like best for easy dinners and lunches. Brussels sprouts and eggs sound perfect together. Just what I was looking for – something to convince my picky friends that brussels sprouts are actually yummy. Thanks! This looks like a really refreshing and interesting recipe. I enjoy the combination of grains, proteins and vegetables that not only looks extremely tasty but offers loads of nutrition as well. I loathe going to the grocery store and will put off going until I have exhausted all possibilities in my pantry/refrigerator. Today I had Eggs, Brussels Sprouts, and Israeli Couscous and not much else. I Googled those two things + vegetarian and came across this recipe. I couldn’t believe I found a recipe incorporating all of these ingredients. And did it wow me! I’ve never had shredded or sauteed Brussels Sprouts and they were delicious. I didn’t have fresh ginger so I substituted a few dashes of ground ginger. This was so delicious. I will definitely be making this again! Can’t wait to try more of your recipes. I recently got this recipe in a newsletter and make it often. I sometimes skip the frying pan and fix the dish in the microwave. Less cleanup on work nights.